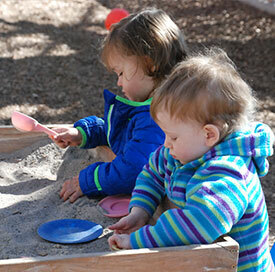 Our Preschool & Day Care is open year round. We are closed on the following holidays: New Year’s Day, Good Friday, Memorial Day, Fourth of July, Labor Day, Thanksgiving and the day after Thanksgiving, and Christmas through the end of the year. Normal tuition rates apply to all these holidays. 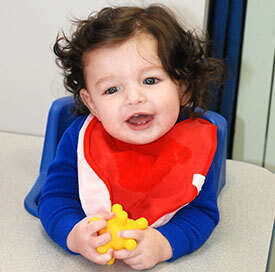 Our Infant / Toddler program consists of caring for the needs of each individual child as necessary. This includes bottle feeding, regular diaper changes as needed, serving meals, holding and rocking, playful interaction and nap times throughout the day. Your children will be exposed to music, singing, finger plays, toy time, worship stories, and outside time. The babies have floor and belly time and will always be held when neededand then some. No child is left in one area for a long length of time, except when sleeping. They are continually checked on, even when sleeping. When approaching toddler age, the children will be doing exercise, art, small and large motor skills, etc., until they reach 2 years old. We always keep a 1 to 4 ratio in our Infant / Toddler program. Our 2 and 3 year old Preschool program consists of scholastics including alphabet, numbers, shapes, colors, rhyming, matching, music, science, art and reading. 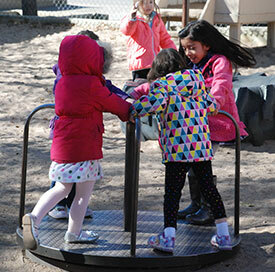 Your child will also go to their specified playground for outside play at least twice daily. More importantly, your child will participate in Worship. The children are taught through Bible stories and songs that God is our creator and that we are all loved by Him. They learn about godly character and principles, and the basic tenets of the Christian faith. Scripture memorization is a vital part of their education. We keep a 1 to 8 ratio in these classrooms. Phonics, reading, literature, writing and learning to write. ABEKA and Animated Literacy Programs are used as well as hands-on pre-reading activities. A variety of reading activities are provided throughout the day using different selections of Bible stories and children’s literature. Prenumeration concepts (patterns and sets), numeration concepts (place value, cardinal and ordinal numbers), math terms and symbols, geometric shapes, standard units of measure (including time), and computational tasks (adding & subtracting). 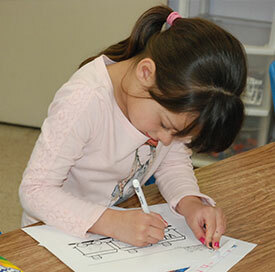 Heights’ goal is to help children understand scientific concepts as well as enjoy them. A study of the wonders of creation is used to stimulate your child’s interest in science. A safe area and plenty of time is provided daily for your child to hop, crawl, hang, throw, catch, jump, and engage in large muscle activities. Simple, interesting play things encourage physical activity; time for creative or expressive movement (dancing, hand clapping, rhythm instruments). We have a 1 to 12 ratio in these classrooms. This program offers a relaxed Christian atmosphere for children, grades Kindergarten through Fifth grade, for before and after school (serving Governor Bent and Comanche Elementary Schools). Busing is provided to and from these schools, according to their individual schedules. If your child is involved in before school care, please have your child at Heights no later than 7:30 a.m.
As part of this program, children are given choices of arts and crafts, games, sports, outdoor play, and free play. 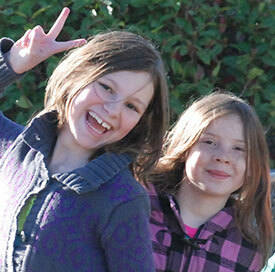 There is also a provision for children to begin working on homework. An important facet of each day is a time for singing praise songs, prayer, and teaching Christian truths and principles. We make every effort to teach the basic moral and ethical values of the Christian faith as revealed in the Bible. We teach the basic premise that: God is our creator and we are all made in His image to be unique individuals with special importance; that Jesus Christ is the means to have a relationship with God, the Father. Through all that we do, we hope to reveal God’s character and His principles. On in-service or early dismissal days there might be field trips scheduled. The parents will be notified when field trips have been planned as to the destination, time, and cost. Enrollment begins in February of each year to in-house families first and then is open to the public. If you are interested in enrolling, please call 505.881.9529 and check for availability. $100/per student: Attending 3 days or more a week to full time, charged each year. $75/per student: Attending 2 days a week, before/after school and summer only students, charged each year. Part time rates are also offered. Multiple child discounts are offered to full time students. Please call 505.881.9529 for more information about our rates.